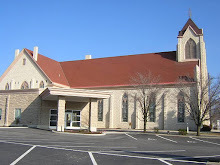 The infant Rettig listed above was the son of Rev. Rettig and his wife Catherine. On another page of the register appears a list of those persons baptized before formal organization of the church, including: Matilda Maria Hoffman, Johannes Miller, and Maria Emma Rothe. 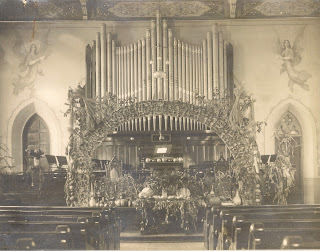 The first funeral services on record were for John Baeker who died on September 11, 1863 at the age of 47 years, and Anna Marie Baeker who passed away on September 18, 1863 at the age of 39 years. There is also an entry for Dorotha Kremmer who died on August 28, 1863 at the age of 69, just a short time before the official formation of our church. 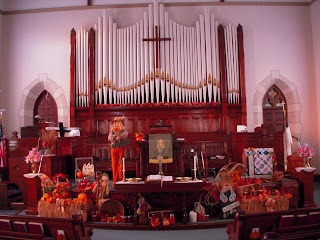 Raise the song of harvest home. 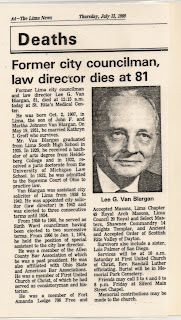 In addition to his professional credentials, Mr. Van Blargan held a keen interest in History as a hobby. "I found some of the archives in the church were gathering dust in the belfry. I thought it was time to look after them or they would get lost." Among the many scattered papers, he found the original Church Constitution. And with great diligence continued to collect documents, artifacts, and wrote articles about our past compiled in a booklet "Down Memory Lane." His research provides one of the main sources of information for this Blog. 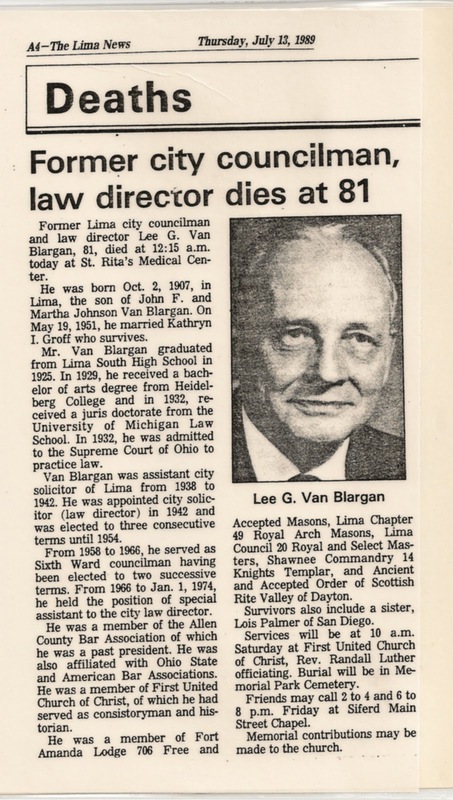 On a clear day, Van Blargan can look out his office window and see the Lima skyline... "When I lean out my window, I can see my church out there," he added with a laugh, "so I have to be good." There is no doubt Lee lived a life of good works. And his legacy will long be remembered in our community and Church archives.